Have you ever stopped to think about how much you love your coffee? Is it one of those things in your life that you can’t imagine not having or is it just the occasional indulgence for you? Are you one of those coffee drinkers who has a very specific method of brewing that even the local barista can’t seem to replicate? Or are you a little more relaxed and will take your coffee whichever way you can get it? If you consider yourself to be a lover of all things coffee, then you have probably spent a little time researching the various methods of brewing. Maybe you’ve been on a quest to find the absolute best cup. Maybe you are tired of using the same coffee maker your mom gave you for your first apartment. And with this research you probably soon realized the coffee world can start to become quite a bit complicated. Who knew there were so many ways to make a cup of joe? Each method of brewing has its pros and cons. Just as people love to debate politics and religion, so it seems to be with which method brews the best cup. But the focus of this article is specifically about the Chemex brand of coffee makers and the pour over method of brewing. The Chemex Coffee Maker - What Makes it Different? 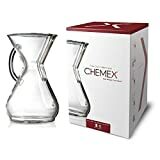 How Does the Chemex Coffee Maker Compare to the Other Pour Over Designs? The Chemex Coffee Maker- What Do We Think? Chemex falls under the Cone type of coffee maker, more specifically the pour over method. The pour over method is quite basic - you have your freshly ground coffee beans, a cone filter and then you pour hot water over the grounds that are placed in the filter. Voila! It’s a very simple method but many coffee addicts love this way of brewing because it allows more control over the strength and taste of the cup of coffee. Since you are bringing the water to a boil, you are in complete control of the temperature too. For the pour over method, you’ll need what’s referred to as a dripping mechanism - something that will actually hold the filter and coffee grounds in place so you can pour the hot water over them. This is where the Chemex coffee maker enters the picture. The Chemex brand coffee maker itself is designed from one piece of non – porous, heat resistant glass. It’s in the shape of an hourglass. There’s also a version available that has a handle attached for easy handling. 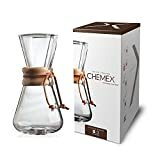 The glass of the Chemex is unique in that it won’t absorb any odors or chemical residues – thus allowing you to brew the purest cup of coffee. There’s an additional piece of polished wood and a leather tie that come with certain models of the coffee maker as well. The polished wood is referred to as the collar. The collar acts as a fastener as well as insulator around the “neck” of the hourglass. The Chemex coffee maker is a very simple design yet it produces a complex cup of coffee. Oh and Chemex has been producing these coffee makers this exact same way since 1941. These coffee makers can brew either hot or iced coffee. The leftover coffee can also be reheated directly on a heat source even while it’s in the glass. The Chemex can be placed directly on a glass stovetop or gas flame for the reheating process. The Classic Series is the basic model within the Chemex coffee maker family. The price starts around $36.95 for the 3 - cup capacity carafe. This model features the polished wood collar and a leather tie. There are 8 different colors of leather ties for you to choose from to allow you to further customize your carafe. If 3 - cups aren’t enough for you or your family, you can also find a 6 - cup, 8 - cup or 10 - cup version. The larger versions will cost an additional $8 to $10 depending on which size you choose. If you prefer the look and extra stability for pouring that a handle has to offer, then the Glass Handle Series is another option for your consideration. The look of the carafe is similar to the Classic Series except you don’t have the wooden collar on this model. Like the Classic version, the Handle Series starts with a 3 - cup capacity. The 3 - cup model is priced around $38. If you are looking for the 6 - cup, 8 - cup or 10 - cup capacity, then it will also cost an additional $8 to $10. If you are looking for the purest type of glass for your coffee brewing experience, then the Handblown series is what you want. Each Handblown coffee maker is completely produced by hand, the same method used for over 75 years. This is where design and function meet in the pour over coffee maker world. The Handblown series is so unique that this product is actually on display at the Metropolitan Museum of Modern Art in New York City. This design is different from the Classic and Handle Series in that there aren’t any seams in the glass. The shape of the carafe is slightly different – the bottom is more on the square side. Some people prefer this design because they feel it offers even more stability. Similar to the Classic and Glass Handle Series, there are multiple capacity options available with the handblown glass. The 3 – cup model starts around $71. From there you can find a 5 – cup, 8 – cup and even an extra large 13 – cup option in this series. 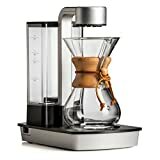 The Ottomatic 2.0 was designed by Chemex for the coffee drinkers who want the convenience of an automatic drip coffee maker, but desire the brewing method of the pour over. This particular coffee maker automatically heats the water up to 204 degrees (the ideal brewing temperature according to Chemex). The machine is doing the heating instead of you having to boil water in your kettle. The price for the Ottomatic 2.0 coffee maker is $350. With the availability of so many different brands of pour over coffee makers, you’ll find each one may have one feature that’s different from the next. You literally have hundreds to choose from. Some of these have stainless filters, others use the paper filters. Some coffee makers are made of porcelain, others are stainless steel or glass. Some of the glass versions are rather flimsy, others are more robust. You can find porcelain versions made by companies such as Mellita, Sanyo, and Tanors. These types of Pour Over coffee makers tend to run on the smaller 1 to 4 cup side. Some coffee lovers feel the porcelain versions take too long to operate, whereas the Chemex makers brew relatively quickly. Porcelain users tend to feel they have more control over the strength and taste of the coffee due to the properties of porcelain. You can also find stainless steel versions made by KitchenAid, Veego, Cafellisimo just to name a few. These models use a permanent stainless steel filter, instead of the paper. Stainless steel filter users may find they are spending less money overall (not always having to buy paper ones). Plus, there is less waste being produced. Stainless steel filter users also swear there is a better taste to the coffee and less sediment that is likely to end up in your cup. Unlike the stainless steel and ceramic versions, the Chemex coffee makers strongly suggest for you to use the Chemex branded filters. The Chemex filters are made of a special paper that work best with the glass. These filters aren’t cheap so you would want to keep that in mind as you are looking across all brands. Coffee lovers appear to be pretty united when it comes to the reviews of the Chemex line of coffee makers. The Chemex appears to be the gold standard when it comes to the pour over method. Overwhelmingly the pros for the product are the great taste. Consumers feel the Chemex brews a superior tasting cup of coffee and is hands – down the best cup you could possibly make at home. If you pride yourself on knowing a good cup of coffee when you taste it, then this may be the perfect product for you. The design of Chemex also wins very high marks. Many people love the clean, artistic design of the carafe. Compared to junky machines that take up quite a bit of counterspace, this product looks beautiful in the kitchen. There are also many people who claim to have had their Chemex for years. If treated properly, it’s designed to last a lifetime. Another trend within the comments is how easy it is to keep the Chemex clean. A quick rinse or placing it in the dishwasher is all that’s needed. Unlike the single – serve or automatic drip coffee makers, there aren’t any plastic parts or tubes to keep clean. On the downside, one drawback of the Chemex seems to be the fragility of the product. Since it’s entirely made of glass, it stands to reason there will be complaints of it cracking or breaking. Many reviews note that the glass in the Handblown Series seems to be much sturdier than the glass used for the Classic Series. One tap that’s a little too hard or an accidental drop and you could have to replace the carafe right away. The other complaint worth mentioning is the price of the Chemex branded paper filters. Many consumers find them to be priced too high. Depending on which filter you choose, a pack of 100 typically starts around $9. 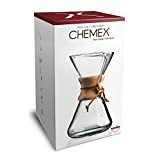 Based on the reviews, you can definitely feel like a true Barista with the addition of the Chemex coffee maker in your home. It’s hard to see any reason not to recommend the Chemex. Between the heritage, the design, the amazing cup of coffee. People who own the Chemex are confident they are drinking the absolute best cup of coffee in its purest form. It’s a true coffee lovers dream come true and we think it’s definitely worth adding to your kitchen.